I visited Bangkok twice and yes, as many know already, it is mainly a place to have fun, to try the thai food and the thai massage and of course to shop in its multiple markets. From India, the direct flights from Delhi, Kolkata or Mumbai are not too long (2-4 hours). Bangkok can be a good option for those looking at going out of the country for a long week end. Thanks to Air India miles, my ticket was almost free for me (5000 rupees!) the initial amount was not so high as well (17 000 rupees DEL-BGK-DEL). Bangkok is the very hectic capital of Thailand. An entry point to many trips in Eastern Asia, most people spend 2 to 3 days to visit and discover its main attractions. We will start the journey with some cultural discoveries. The Grand Palace is the most reputed attraction of Bangkok and it’s a must-see for any visiting tourist. 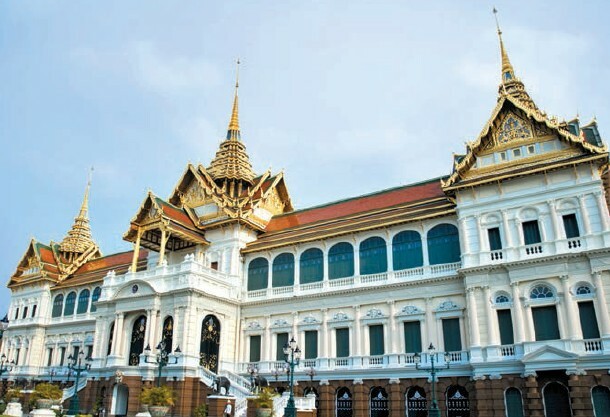 Built in 1782, the palace is a beautiful, vast complex that used to be the residence of the kings of Thailand. To fully enjoy and discover the intricate architectures of the palace, one must spend at least two to three hours. Standing next to the palace, don’t miss the Wat Phra Kaew (or Temple of the Emerald Buddha) that was build in the 14th century. The temple is decorated by mural paintings depicting the Ramayana, it is also entirely incrusted with precious stones. Wear your sunglasses if you go there during on a sunny day, as the temple is particularly bright! Guides can be hired at the ticket kiosk; ignore offers from anyone outside. An audio guide can be rented for 200B (INR 372) for two hours. A strict dress code applies. The Grand Palace with the Temple of the Emerald Buddha is Thailand’s most sacred site. Visitors must be properly dressed before being allowed entry to the temple. Bangkok is a paradise for shopping lovers and will actually make you shopaholic! The gigantic malls are home to multiplex cinema, plenty of restaurants and numerous shops selling almost everything. Every mall has its speciality, if you are looking at good deals head to MBK Mall. If you are a gadget freak, go to Pantip Plaza, the technological hub of Bangkok. Among the luxury malls where you will find all international brands, you can shop at the CentralWorld, the Siam Paragon and The Emporium. But the best deals are done in the streets; the markets are a must to feel the unique atmosphere of Bangkok. The Chatuchak market is one of the most famous of Bangkok; you can find anything here, from clothes to flowers or microwaves and even domestic animals like dogs, cat, birds and reptiles. Thais love to party until late at night and every day of the week! 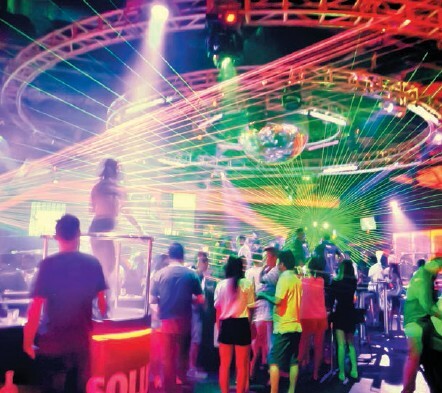 Royal City Avenue – more commonly known as RCA – is the epicentre of the clubbing scene in Bangkok and has an active nightlife seven nights a week. Nightclubs such as Route 66 and Slim are open every evening and on weekends, they are packed with international DJs and live music concerts. Soi Nana is the most prominent red light area of Bangkok. It is not a tourist attraction but will satisfy the curious. Stop at Nana station and discover the many bars. Girls and “lady boys” freely strut about in the street half naked. However, be very careful about alcohol and drugs that flow freely in this area. Le Pad Thai – a dish of noodles, generously doused with vegetables and crushed peanuts – is one of the most popular dishes here and costs a bare BHT 60 (900 INR) on most of the street-side stalls. The sellers here would be eager to sell other wares, fried or otherwise, including grasshoppers, beatles and even live prawns. Besides these kiosks, the Thai restaurants serve all the classic dishes such as green curry, and also some unusual options. The Tom Yum noodles are especially delicious and the Thai desserts, often overlooked by travellers, offer a perfect remedy to the very spicy curries! You will find Thai restaurants and local specialties in the streets and everywhere else, but if you really want to treat yourself during your stay in Bangkok, go for dinner at Vertigo Restaurant in the Banyan Tree Hotel on the Sathorn Road. Food is expensive here by Thai standards, but it is definitely among the best in the city. Located on the 61st floor of the hotel, besides your food, you will also enjoy magnificent views, especially at sunset. If you are a vegetarian and like to stick to Indian food, you will find restaurants, but the best option would be to head to the Indian quarter of Indra market. Traditional Thai massage is perhaps the best known. In all, the process may take more than an hour, and during that traditional massage your body will be twisted and stretched in every direction. There are other softer options such as massages with essential oils or foot massages. The essential oil massage takes place in a closed cabin by a curtain and the masseuse mass you skin with scented oils. When choosing a massage place, be vigilant. There are hundreds or even thousands of massage parlours in Bangkok and many of them are thin covers for prostitution.